Active vari‑directional array loudspeaker with coaxial drivers for improved high frequency response. 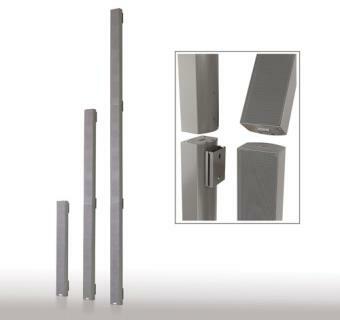 Active vari‑directional array extension, to be used with a base unit to increase the coverage distance. A maximum of two extension units can be used with a base unit. Módulo CobraNet para conectar el array activo varidireccional a una red CobraNet. El módulo se debe montar dentro de la unidad básica. Configuration set for the vari‑directional array contents: USB to RS‑485 converter, USB cable (1.8 m) for connection to the PC USB port and RS-485 connection cable (5 m) for connection to the vari‑directional array.